Forget about the Strip -- at least for now. 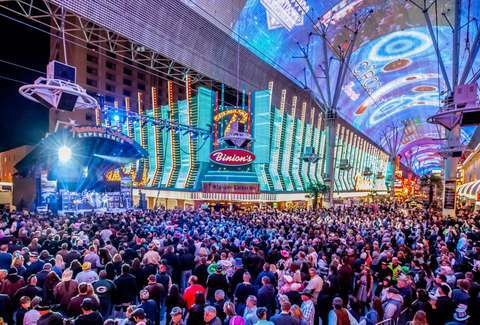 Make your way downtown to Fremont Street, the tourist-driven destination that's all about classic neon marquees, gift shops, and the stench of beer. It's a historic stretch of Las Vegas that's become a lot busier and more boisterous in recent years -- and in between the penny slots and street performers, there's plenty of cool stuff you'll want to check out. Head to the Golden Nugget's pool area and check out The Tank, a 200,000-gallon aquarium in which five different shark species manage to get along surprisingly well with the stingrays and other exotic fish. The cool part is the waterslide that passes directly through the center of the tank, an immersive experience that's both beautiful and terrifying at the same time. A lot of Downtown restaurants come and go, but Carson Kitchen manages to not only survive, but thrive. Launched by late celebrity chef Kerry Simon, the casual dining spot is run by Executive Chef John Courtney, one of our favorites, who always keeps the menu fresh and compelling with regular updates. 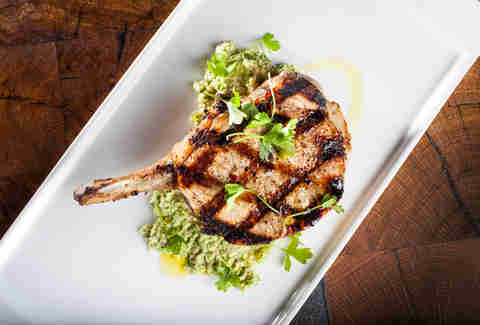 (A jalapeño pesto pork chop was recently introduced and is proving to be a big hit.) Sometimes the wait for a table can be long, but additional rooftop seating opens when the weather is right. Carson Kitchen is also in the process of expanding into the old tattoo parlor next door, which will relocate the bar and open up some much-needed space. The Golden Gate has been around for more than a century and is undergoing a major renovation and expansion after taking over Mermaids next store. But there's still plenty of cool history to check out, including vintage whiskey bottles and an authentic replica of the very first telephone in Vegas. To get even further into the old-school spirit, grab a seat at Bar Prohibition!, where cocktails are discreetly served in coffee mugs, just like back in the day when booze was illegal. Keep walking east on Fremont and once the neighborhood starts to look a little shady, you'll come across PublicUs, a coffee shop that offers much more than cold brew and WiFi. The baristas are like bartenders, so stop trying to find the overhead menu (hint: there isn't one) and just have a discussion with them about what you're in the mood for. 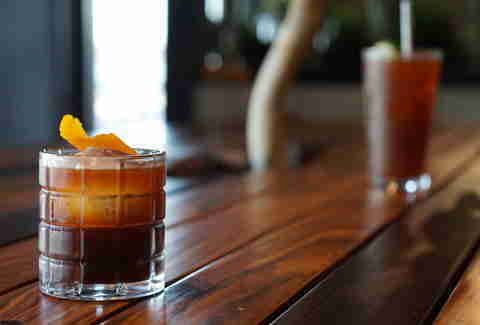 Of course, our favorite will always be their caffeinated spin on an Old Fashioned, with espresso in place of whiskey. 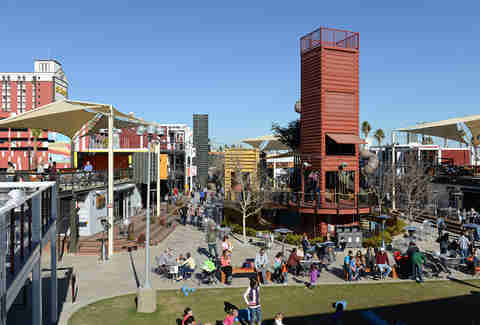 Like Navy Pier in Chicago, the Downtown Container Park in Vegas is one of those places locals usually only visit when they have relatives in town. It features shops and restaurants built inside old shipping containers, and while the place feels like a tourist trap, there are a few spots worth checking out, including Oak & Ivy for whiskey and cocktails, Bin 702 with wine on tap, and The Perch for a second-floor view and an especially good brunch. You can also enjoy an outdoor movie during the summer months. 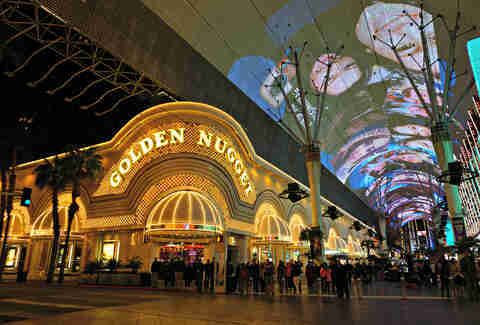 This best way to check out the size and scope of the Fremont Street Experience could be from the air. 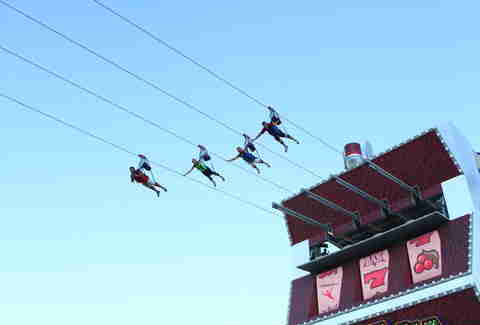 Slotzilla is a 12-story replica of a slot machine that shoots out two levels of zip lines, including one where participants are horizontal superhero-style. It's pretty cool, even though it's so large that it blocks most of the view from Fremont East. Vegas has plenty of good pizza joints, but let's face it -- Pizza Rock smokes the rest. You can find the Downtown restaurant just a block north of Fremont on Third and Ogden. 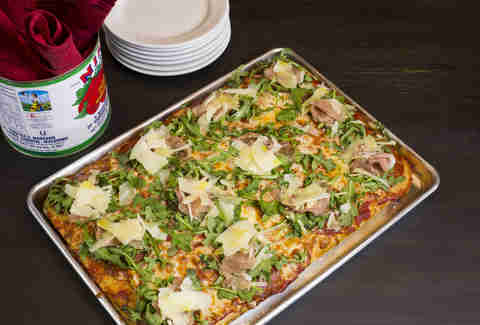 Pretty much every style is covered, from New York to Chicago and lighter foo-foo fare topped with arugula and prosciutto. If you're out late, grab a slice from the walk-up to-go window. The extended hours are perfect for anyone craving a bite after a night of drinking at one of the many Fremont bars. 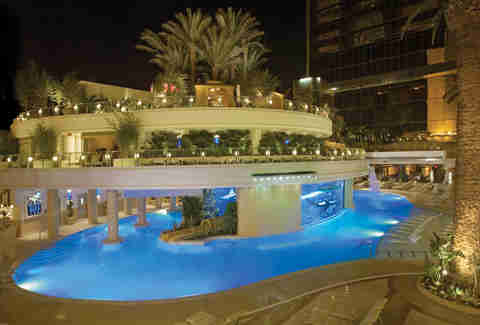 The D Las Vegas has always favored festive fun over subtle elegance. And that was never more clear when the casino unveiled its own replica of Manneken-Pis, the famous 17th-century bronze statue in Brussels of a little boy taking a leak in a fountain. The statue, often dressed in different outfits based on seasonal events, is "signed to a 100-year contract," making him the longest entertainment residency in Vegas history. (We suppose Wayne Newton is a distant second.) In case you were wondering, Manneken-Pis translates to "Little Pee Man" in Dutch. Wherever you go on the street, you'll find plenty of beer to drink. Pay a visit to the Fremont East District where pubs like Commonwealth, The Griffin, and Beauty Bar are willing and ready to pour a draft. Travel to the west end and you'll come across Main Street Station, a casino that has its own brewery inside. The best bet, however, is Banger Brewing in front of the Neonopolis. Its own lineup of craft beers competes with the top options in Vegas. Try the jalapeño-infused hefeweizen or the kolsch dry-hopped with coffee beans. You know Vegas Vic. You've seen him a zillion times. The neon cowboy who makes smoking seem cool again. The iconic marquee originally marked the entrance to the Pioneer Club, which closed down years ago. Yet Vic stuck around and is now puffing on heaters by a souvenir shop near the Golden Nugget. 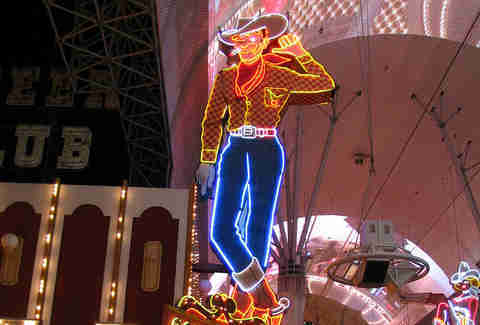 Fun fact: his hat needed to be trimmed down to fit underneath the Fremont Street Experience canopy. 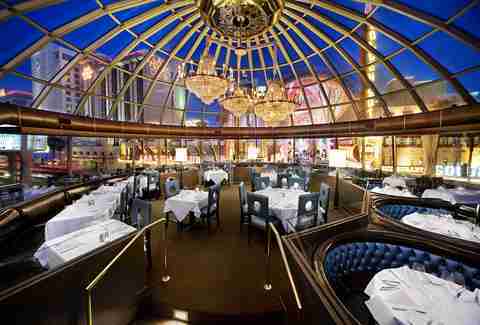 Oscar's Steakhouse at the Plaza mixes tasty hunks of red meat with a classic Vegas atmosphere that would make the Rat Pack, or maybe Bugsy Siegel, proud. Named in honor of former mayor and mob lawyer Oscar Goodman, the restaurant has a vibrant happy hour and a distinctive circular dining room that's been featured in movies like Casino and boasts some colorful Downtown views. Goodman himself shows up frequently, trademark martini in hand, and hosts a regular dinner series that's full of juicy stories about the mob days. You may not win big on the casino floor, but the Golden Nugget offers a vulgar display of wealth near the North Tower lobby. 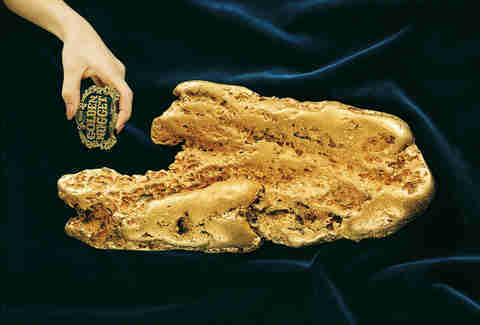 The Hand of Faith is the largest gold nugget on public display in the world today, weighing in at 61 pounds, 11 ounces. Soak in its majesty before returning to the slot machines with some much-needed inspiration. Before the craft cocktail revolution took hold, the Downtown Cocktail Room was a few steps ahead of the game in Las Vegas. 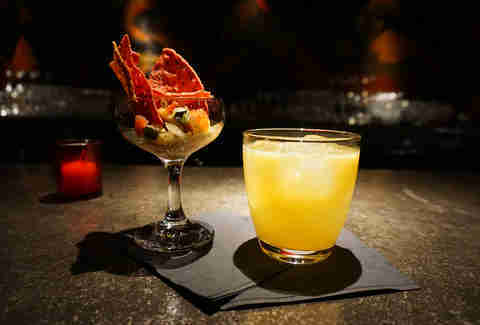 Long known for its adventurous nature, the creations are designed by a mad scientist-like team of mixologists eager to experiment with a menu that changes several times a year. 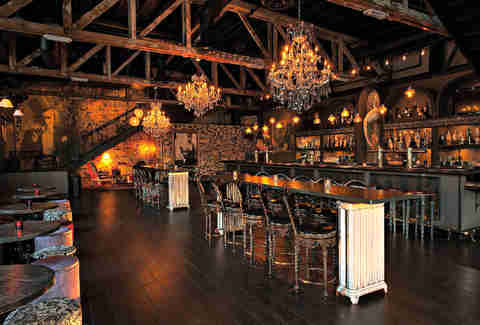 The punch bowls are good for large groups and the deep absinthe selection is good for anyone with an ambitious spirit. Near the intersection of Fremont and Las Vegas Boulevard, the bar is a bit tucked out of the way and includes a trick door that takes a moment to figure out (push on the big metal wall and you’ll find your way in). Rob Kachelriess has been writing about Las Vegas for Thrillist for nearly four years. His work has also recently appeared in Travel + Leisure, Vegas Seven, David Magazine, Vegas Magazine, and Luxury Estates International's seasonal publication. He's planning where to begin his Fremont Street beer crawl. Follow him on Twitter @rkachelriess.